The news is not yet official, but is already being discussed – as from October, the Italian flag will be flying over Camp Darby. Are the United States about to close down the largest arsenal they have in the world outside of their homeland, and return to Italy the approximately 1,000 hectares of territory that they occupy between Pisa and Livorno? Not at all. They are not in the process of closing down, but restructuring the base in order to be able to store even more weapons, and to increase the liaisons with the port of Livorno and Pisa airport. In the restructuration, a small portion of the recreation area remained unused – 34 hectares, hardly more than 3 % of the total surface of the Camp. This is what the US Army Europe has decided to give back to Italy, more specifically to the Italian Minister for Defense, in order to use it more productively. So an agreement was drawn up planning for the transfer to this area of the Comando delle Forze Speciali dell’Esercito (COMFOSE) which is presently housed in the Caserne Gamerra in Pisa, headquarters of the Centre for Parachute Training. These are the Forces which are used more and more frequently for secret operations – they infiltrate foreign territory by night, note the targets to be hit, eliminate them with sudden actions by parachuting from planes or jumping from helicopters, then disappear without leaving a trace other than the dead and the destruction. Italy, which had used these forces especially in Afghanistan, took a decisive step in their potentialisation when, in 2014, it made the COMFOSE operational – it now counts four regiments under a unified command – the 9th assault regiment Col. Moschin and the 185th Folgore regiment for the acquisition of targets, the 28th communications regiment Pavie and the 4th Rangers Parachute regiment. During the inauguration ceremony in 2014, it was announced that the COMFOSE would maintain a “constant liaison with the US Army Special Operations Command”, the most important US command for special operations, composed of approximately 30,000 specialists employed particularly in the Middle East. At Camp Darby – as was specified last year by Colonel Erik Berdy, commander of the US Army Italy – joint training operations were already under way with US and Italian soldiers. The transfer of COMFOSE to an area of Camp Darby, which legally belongs to Italy, will enable the complete integration of Italian and US special forces, and their use in secret operations under US command. All of this under cover of military secrecy. It is therefore difficult not to think about the history of secret operations at Camp Darby – the investigations of judges Casson and Mastelloni revealed that since the 1960’s, Camp Darby has served as a base for the putchist network created by the CIA and by the SIFAR (Intelligence Service of the Italian Armed Forces) in the context of the secret Gladio plan. The USA/NATO bases – wrote Ferdinando Imposimato, honorary President of the Supreme Court of Cassation – supplied the explosives for the massacres of Piazza Fontana, Capaci and Via d’Amelio. In these bases “extreme right-wing terrorists, NATO officers, mafiosi, Italian politicians and Freemasons gathered together on the eve of the attacks”. And yet no-one, either in Parliament or the local collectives, worries about the implications of the transfer of Italian special forces, which, inside Camp Darby, will be under US command. 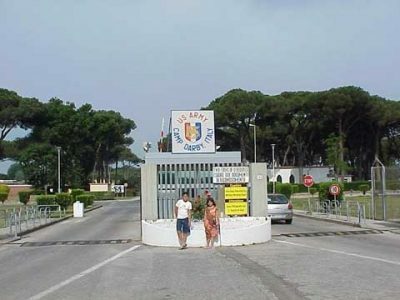 The municipalities of Pisa and Livorno, which passed respectively from Pd to the Lega and M5S, have continued to promote, with the region of Tuscany, “the integration of the US military base of Camp Darby with the surrounding community”. A few days ago, it was decided to integrate the Web sites of the local administrations with those of Camp Darby. The Camp Darby network is expanding increasingly across the territory.